With Class 10 and UHS Speed Class 1 (U1)**UHS Speed Class 1 designates a performance option designed to support real time video recording in UHS-I enabled host devices. video ratings you'll be ready to capture cinema quality 3D and Full HD**Full HD video(1920x1080x30fps) and HD video support may vary based upon host device, file size, resolution, compression, bit rate, content and other factors. 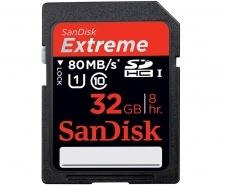 See www.sandisk.com/HD video (1080p), which require more performance than ordinary cards can handle. This memory card's accelerated minimum sustained write speeds ensure no video data is lost during recording, by reducing dropouts and stuttering. Designed and tested to withstand the toughest conditions, card capacities 16-64GB are waterproof**Water proof: Tested to withstand up to 72 hours in 1m salt or fresh water; IEC 529 IPX7; product must be clean and dry before use. Capacities up to 64GB only., shockproof**Shock and vibration proof: Capable of withstanding up to 500Gs of shock. Capacities up to 64GB only., and X-ray proof**X-ray proof: Immune to airport X-rays. Capacities up to 64GB only.. It can operate in temperatures ranging from -13 to 185 degrees Fahrenheit, so you can snap the perfect shot in almost any climate.